Many people new to homeschooling think they have to keep up with their local public school so closely that they probably need the textbooks the local school uses. School textbooks are meant for large classrooms and can be harder to use at home, plus textbook sellers geared toward schools can make them difficult to purchase. They’re not tailored to your individual child’s needs. They’re usually not especially fun or inspiring. It’s also not necessary to do things the way schools do them or even to teach the same information at the same time. As students get to high school, you probably do want to use some textbooks, but even then, you can choose the textbooks that are best for your student, which may mean using a college textbook or a less popular textbook. You still don’t have to use what your public school uses. Sometimes complete curriculum is right for a family, but starting with one is tricky. Complete programs are usually a bigger investment. If they’re not right for you, you’ve lost that money. They also teach at a single level for all subjects when most kids aren’t usually at a single level. They tend to be more rigid or need to be tweaked to fit into your lives. Accreditation is meaningless in homeschooling. Most programs for homeschoolers that claim to have some sort of accreditation have it from a less recognized Christian based agency. Curricula by themselves cannot be accredited by any serious accrediting agency. Online programs can be, but, again, with a few exceptions of families living abroad or in special circumstances, accreditation is not something that is required. Colleges are not interested in seeing accreditation. Similarly, you do not need to seek a program that is “Common Core aligned.” No outside group verifies how good such programs are as any curriculum can make that claim. Some programs that claim alignment are great, but it is not something you need. If everyone online or all the new friends you meet are fans of a certain program, that might be an indication that it’s good, but remember that you’re not them and your kids have their own needs. There are lots of options out there and don’t feel like you have to be swept up in whatever is newest and coolest. Most homeschoolers are going to want curriculum, but don’t feel like you have to buy things right away. Take some time to get to know yourself and your child as a learner before diving in with a lot of money on curricula. Also remember that it’s okay to “wing it” or make your own curricula with a list of books and other resources you’d like to use. Technology can be a great tool for learning. However, beyond a simple computer with internet that you likely already have, you probably don’t need anything else, at least not until you’ve gotten to know your kids a little better to see what will really work. A lot of technology based learning isn’t all it’s cracked up to be. While it’s wonderful that there are so many online course providers, not all courses are created equal and starting with a line up of many online options isn’t usually the best way forward. Reading, writing, observing, doing, and discussing are still at the heart of a good education, none of which require any special technology. Finding social outlets can be important, but don’t feel like you must jump into a large co-op to do so. Sometimes these groups are great, but sometimes they’re not all they’re cracked up to be and they take up a large chunk of your time. If you have a good one nearby, that’s excellent, but you don’t have to dive into one to be doing a good job. You need a clean space in your house and somewhere to park your materials, but, in my experience, school ends up happening in the heart of your house no matter what you try to do to organize it differently. If you have the space, a special school room can be cool, but it’s not a necessity and you should wait until you’ve seen what homeschooling is like for you before you turn that extra den into a school room. Some parents immediately jump to the conclusion that they can’t teach certain things and will have to get a tutor or outside class to cover it. Sometimes you do need a tutor, but don’t make that assumption off the bat. Learning alongside your child can be powerful too. Also remember that schools often try to make subjects seem more complex than they are, and that a good curriculum is there to guide you. PS – Don’t Miss The Sequel! 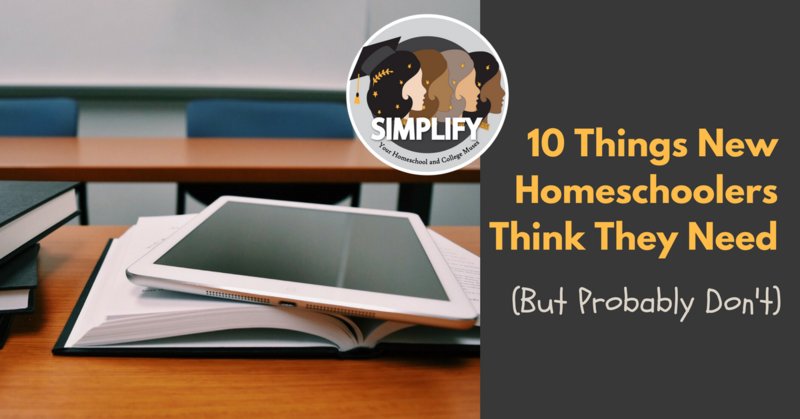 Ten Things New Homeschoolers Don’t Know They Need (But Probably Do). Next StoryYes, Homeschoolers Can Teach APs at Home!